Konica Minolta takes monochrome production to next level with AccurioPress 6136 series launch | Industry Analysts, Inc. The affordable and cost-effective series consists of three models: AccurioPress 6136, AccurioPress 6136P and AccurioPress 6120. Each delivers greater productivity to enhance job capacity, reliability and flexibility enabling operations to expand their capabilities. With the highest productivity in its class, this takes monochrome production printing to the next level. Konica Minolta has been a pioneer and set new standards in the industry for over 10 years. This next generation series of monochrome products will help our customers to be well prepared for today’s and upcoming demands in the printing industry. 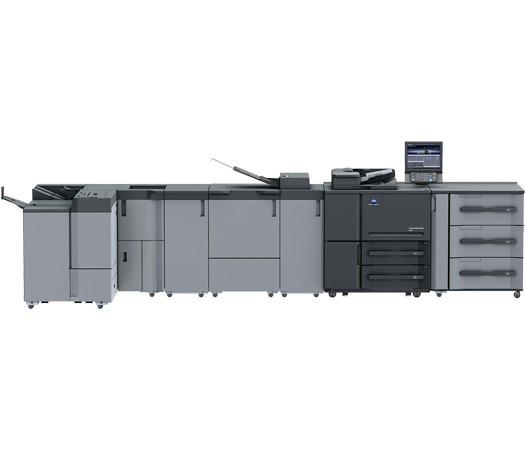 The Konica Minolta AccurioPress 6136 series can produce a monthly peak volume of up to 3.24 million A4 pages and offers the highest media flexibility in its class. It enables print providers to create more business opportunities by handling a wide range of essential digital printing applications. The series supports various media types, such as coated and embossed paper from 40gsm up to 350 gsm. There is an intelligent paper catalogue and optional envelop fuser aiding media flexibility to provide ultimate performance for the user. Automatic and real-time density and registration adjustment is delivered by the IQ-501 as is the ability to create printer profiles with skill-less operation. This helps eliminate input time and reduces errors. Curl adjustment is managed via RU-518. The environmentally friendly series also offers the highest finishing flexibility in its class with over 728 different configuration possibilities. These choices include Konica Minolta own-developed finishing as well as partnerships with market leading companies such as Watkiss, GBC and Plockmatic. OpenAPI provides high scalability via a seamless interface between Konica Minolta production printing devices and third-party solutions and there is seamless integration with AccurioPro workflows. It enables accounting, authentication or scan routing such as YSoft Safe Q and Nuance eCopy Sharescan. A unified UI and remote panel operation help smooth set up while operations can be flexibly controlled and confirmed with a mobile device.Konica Minolta’s IWS (Internal Web Server) allows the User Interface to be customised based on operator requirements, which makes every day work more efficient. IQ-501 is a unique invention that helps customers produce perfect print products while support for customer workflows facilitates easy integration. Last but not least, professional finishing options save time and eliminate errors while delivering high-quality products in one click. This entry was posted in Konica Minolta and tagged AccurioPress 6136, Konica Minolta by IA Staff. Bookmark the permalink.